The male Broad Bodied Chasers have got all dressed up for the summer. It takes a week or so from when they first emerge as glittering, golden bundles of energy to acquire this fine blue. Slowly the males' abdomens darken then a haze of sky blue, called prunesence, coats their tails. The younger males look much like females except they have slightly narrower abdomens. They keep out of the way of the mature males in their blue war paint, hanging around hedgerows and paths rather than risk conflict with their older kin. This nervousness changes once their blue fighting and mating colours have developed . Then it is time to head to a pond and challenge for a territory. 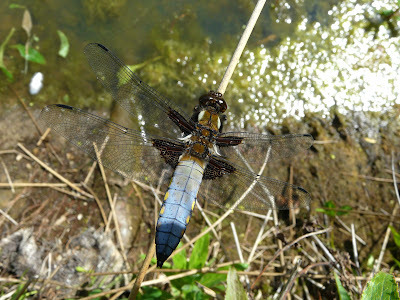 These Chasers fly fast, often low but with erratic zig-zags, back and forth across ponds, even small, garden sites. They do not mind nearly dug out pools and are happy in cities. Every few minutes the territorial males perch on obvious branches and stems, and you can get close (the photo above was taken with an ordinary digital camera, not a telephoto). They are much more concerned about air-borne rivals than sneaky humans. 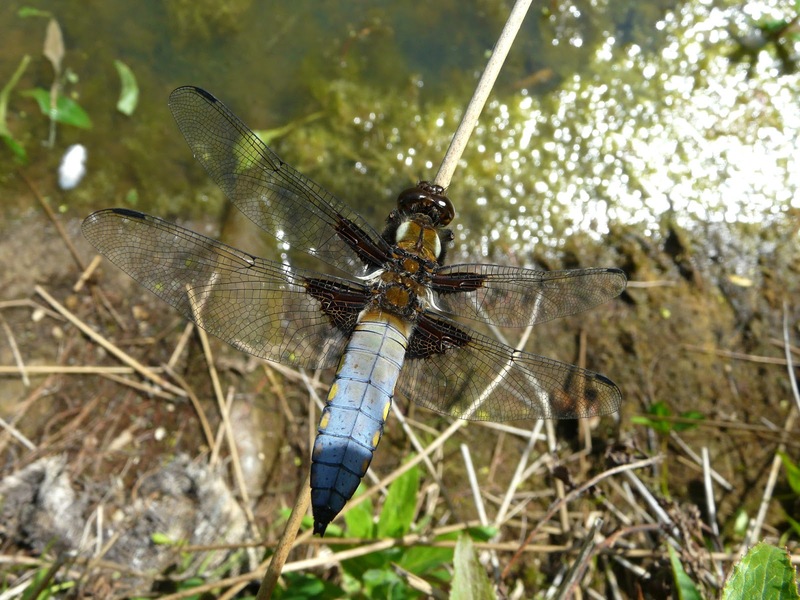 Adult Broad Bodied Chasers are good colonists and can turn up almost anywhere. They may not have bred from the ponds across which they now patrol and fight. 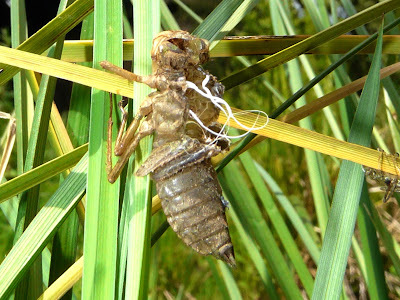 The best evidence for breeding is finding their larvae, called nymphs, or the cast skins left behind as adult emerge. These skins are called exuviae. They are as gnarly and peculiar to look at as the adults are glamorous and racey. 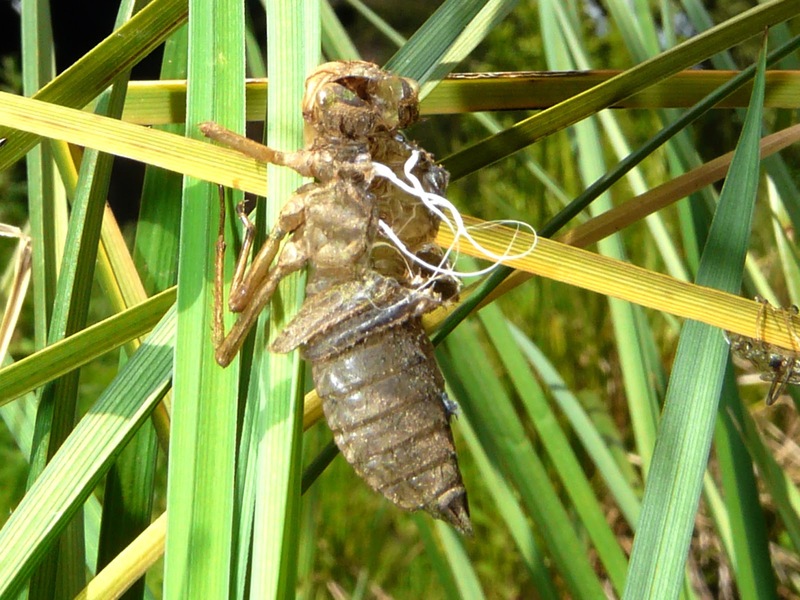 Here is one, the exuviae looking like some parchment mould from which the adult has been cast. The wispy white strands are where the cast skin ran inside the length of the breathing tubes, (trachea), that ramified into the body of the larva to carry oxygen. When the adult emerges and pulls itself free of the old skin these are pulled inside out a bit like when you take off a jumper or coats and the sleeve gets pulled inside out. The dragonfly season is hitting its stride. Northumberland remains a poorly recorded county for dragon and damselfies, even areas such as Druridge Bay that attract good numbers of bird watchers and outdoor enthusiasts. Northumberland is a region into which new species have expended from further south, and the east coast of England is the likely first land fall for occasional vagrants from the continent, just as with rare birds. The western hills and bogs are even less recorded. Well worth watching out, you are very likely to find something new.